Results for - Woodstock To Celebrate Its Golden Anniversary Woodstock-Style! 1. It promises to be the music event of 2019. A three-day festival is currently being planned in honor of Woodstock's 50th anniversary, and if nearly 500,000 people attended a concert when social media wasn't around to promote it, can you imagine the number of people who are going to show up for this thing in today's day and age? The Bethel Woods Center for the Arts, which was built on the original Woodstock site, will host the event from August 16 to August 18 this year. According to Billboard, many motels, hotels and Airbnb rentals in Sullivan County, New York — about 80-something miles northwest of New York City — are already booked solid for the upcoming festivities; places to stay closest to the event have also been booked up for quite some time. Do you plan to attend, or wish you could? 2. Plans for this event have been in the works for almost three years, but now with a date confirmed, it is indeed reality. Were you one of the lucky ones to attend the original Woodstock back in August 1969 or any of the subsequent "Woodstock" events (such as the "forgotten" Woodstock of '89) in the last fifty years? 3. 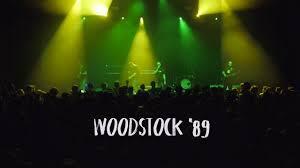 Just for you who answered "Woodstock? ", Woodstock was a three day music festival held in August 1969, on Max Yasgur's 600-acre dairy farm near White Lake in Bethel, New York, 43 miles (70 km) southwest of Woodstock. It was one of the most pivotal music events in history, hosting a dream lineup of musical acts, both famous, infamous and emerging new artists. Which Woodstock trivia do you know? 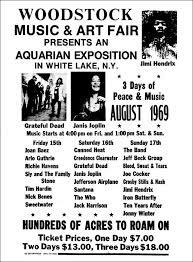 Some of the best musical acts of the era played at Woodstock, including Jimi Hendrix, The Who, The Band, Janis Joplin, Johnny Winter, Creedence Clearwater Revival, Jefferson Airplane, Ten Years After, Joan Baez, Santana, Joe Cocker, and Crosby, Stills, Nash, and Young. 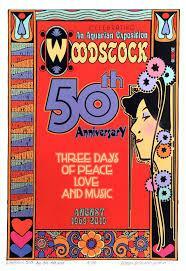 It cost $6.50 for one day, $18 for all three days (advance sale) and $24 at the gate to attend the original Woodstock. It became a "free" event only after the event drew hundreds of thousands more people than the organizers had prepared for. Rock god Jimi Hendrix, who was among the biggest rock stars in the world at the time, was paid $18,000 to headline the weekend. Blood, Sweat and Tears was reportedly the second highest-paid, pulling in $15,000 — while Joan Baez and Creedence Clearwater Revival got $10,000 a piece. It took a decade for the Woodstock organizers to turn a profit. Roberts, Rosenman, Lang and Kornfeld spent nearly $3.1 million ($15 million in today's money) on Woodstock—and took in just $1.8 million. That weekend, Bethel was the third largest city in New York State. Feeding nearly 500,000 people was a logistical nightmare. Members of the Hog Farm, a New Mexico-based commune initially hired to help keep the peace, quickly switched gears, recruiting new (temporary) members on the spot to help cook and serve to the masses. When a local Jewish Community Center heard about the food shortages, they too sprung into action, supplying thousands of sandwiches that were eventually flown into the area from a nearby air force base. With Sweetwater, the concert's first scheduled performer still stuck in traffic, organizers scrambled to find a replacement, finally selecting folk signer Richie Havens. 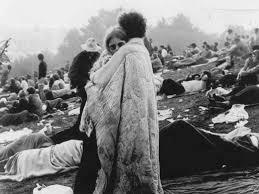 There were three deaths at Woodstock, but no confirmed births. No births were recorded at the site itself, but eight miscarriages were. When the festival was finally over, the New York State Department of Health recorded 5,162 medical cases over the nearly four days, 800 of which were drug-related. 4. No word yet on who will be performing at the Woodstock 50th Anniversary festival, but wouldn't it be great so see some of the original performers on stage to commemorate this event? Which of these living performers who appeared at the original would you love to see there?